Whether you’re starting out or looking to grow, you will probably need access to some form of finance. So where can you go? This section goes through the various types of finance out there, the benefits of each and where you might go to get some. Finance options will depend greatly on how you have set up your company. As we noted earlier, your social enterprise could be a charity or a company limited by guarantee amongst other forms. Choosing a charity status over a company limited by shares will differ your choices. As social enterprises are mostly companies limited by guarantee and often have charitable status, we have focussed on those options primarily for raising income. Normal lending institutions such as banks are a first stop for many bank loans. You will most likely have a bank account with a bank that lends to companies for a rate. As there are a number of pillar banks in Ireland, it pays to shop around for the best deal on getting a loan. These loans could provide small and short terms loans including overdraft facilities. Banks have also been open to larger community projects and have backed capital projects with long term loans. Banks will require all of the documentations that you will expect, including the company status and previous history. There are two social investment lenders in Ireland. These include Community Finance Ireland (http://www.communityfinance.ie) who offer finance focussed on a social return to communities. While they fund social enterprises, social lenders also fund community sport halls, community energy schemes and more. The finance is given by way of loans which will have a repayment period and amount. Social enterprise incubator and accelerator programs are specifically designed to help social entrepreneurs and social enterprise create and grow sustainable businesses. Ireland has a growing number of supports including from Social Innovation Fund, Social Entrepreneurs Ireland, BNest and more. These programmes match some seed funding with a programme that brings social enterprises on a rapid journey to prove their concept and help them achieve scale. There is a global rise in the number of competitions that are opening up to social enterprises. If you work on your messaging and developing your ask, you should consider many of the open opportunities to pitch with others for a pool of cash and for publicity. Many traditional entrepreneur awards are also opening up to social entrepreneurs and the same is for social enterprise. 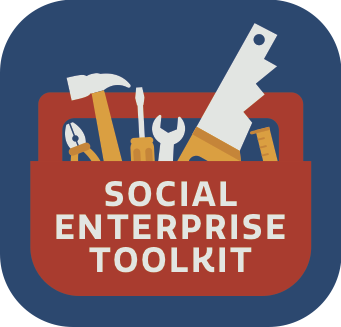 Consider which competitions might be worth entering and check out https://socialenterprisetoolkit.ie website for more competitions. Of course, you can raise money by looking to your family and friends and wider community. When asking for money however, be clear on the reasons you need the monies, make sure that people are aware of the risks involved and be as open and transparent as you can on whether you will be repaying the money or not. Be careful when drawing on this as a source of your first fundraising efforts! There are plenty of crowd funding initiatives that you can avail of now thanks to innovative crowdfunding platforms. You can receive a considerable amount of income from people who are engaged in your idea. However, there is a process to setting up a crowdfunding campaign. Our advice is learn all you can about successful campaigning and when it all goes wrong. Perhaps you have the money and the time to bankroll your own social enterprise. Keeping your organisation lean and starting small and simple could allow you to grow your social enterprise on your own dime. Self funding also shows investment and commitment and can also increase your chances of others funding you as you are showing trust with your own cash. Make sure that you are not eating into your own livelihood in the process however. Manage your risk. While the term ‘impact investment’ is not fully realised or known in Ireland compared to our European neighbours, there are always investors that want to see a financial and social return for their capital. While we like the forum in Ireland to scale this new class of investor, that doesn’t mean that if you have a compelling story, a good return to someone for their investment and a measured impact, that you can’t find people who would be willing to invest. There are also a growing number of grants for social enterprises and social impact organisations more widely. The details are always changing but annual initiatives such as the Inner City Enterprise Social Enterprise Awards give away €50,000 in grants to a handful of social enterprises every year. Winning might be a small amount to the overall amount you need to achieve your goals, but well thought out social enterprise ideas can achieve great success with projects that start from €10,000 or more. 7.1 What do you need the money for? Different circumstances and needs lend themselves to different types of finance. For example, social enterprises often use grant funding to start up new income-generating activities and then look for non-grant finance as the enterprise develops to become more self-sufficient. Commercial finance is often called for when a specific financial need has arisen or long-term planning requires financial sources beyond grants and generated income. Examples include purchasing property, managing ongoing cash needs, funding a growth in operations and renovating a building. How much finance you need will also affect your options as some finance providers have limits on what they will lend or give. Grants vary in size depending on the grantmaker. Commercial banks often don’t consider loans for less than €10,000 but can consider much larger sums. Equity finance tends to start at even larger sums, typically €250,000 or higher, although some providers might make smaller investments. Social Investment lenders are usually available to provide information on finance. There are some typical questions that an investor or funder is going to ask. Many of the answers to these questions should be contained within your business plan, but it’s useful to prepare a master document that is used for funding applications so any team member can copy and paste information into applications efficiently and consistently. Each time you complete a funding application you’ll probably find a new question so make sure you add this to your master document. When you are seeking finance, the areas that banks and social lender look at are more commonly broken down into 5 C’s. These are Character, Capital, Conditions, Capacity and Collateral. Your presentation needs to tell the investors what they want to know. Where possible ask for a list of questions from the Investment Panel to identify what they are looking for first so you can prepare a presentation accordingly. Remember to prepare an investor pitch that comprises a number of communication tools to ensure it communicates effectively to your different types of audience. Practice your presentation and try to mimic real life settings as much as possible. Try speaking the presentation to someone you would trust would ask you the right questions. You are aiming for being so comfortable with your business and all of your figures that you will show your passion for the idea and for the impact your social enterprise will have.